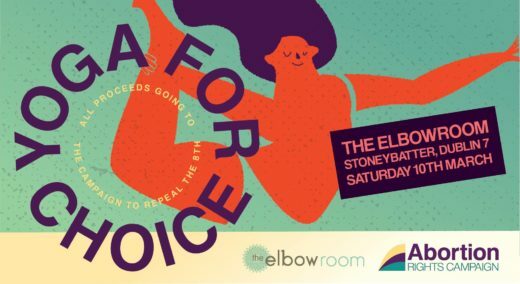 The elbowroom and the Abortion Rights Campaign are hosting a full day of yoga classes, with all proceeds going directly to the Repeal the 8th campaign. Come move, flow, breathe, lengthen, strengthen, and let go, all in the knowledge that your ticket price is going directly towards a more compassionate, humane reproductive healthcare system in Ireland. Moonteoir is a flowing practice of connection to our Yoni Shakti – our source energy. Ashtanga yoga improves circulation, calms the mind, and strengthens the body. Mixing softness with strength, body work with working bodies, and good intentions with practising communications. Helps to build trust in yourself and other people, and most importantly, it is pure craic! Yin Yoga is a slow-paced style of yoga that targets the deeper connective tissues of the body. Poses are held for longer periods of time (anywhere from 3-10 minutes), facilitating a more meditative experience. This class will take you through a series of focused, progressive postures to help reshape muscles, increase strength, flexibility, balance, and coordination.